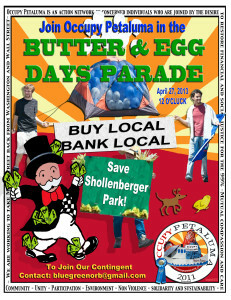 The Hubbub Club will march with Occupy Santa Rosa Band in the Occupy Petaluma contingent at the Butter & Egg Day Parade this year. The parade theme this year is “Legends of Petaluma” and the Occupy entry will address how Big Banks increasingly undermine and destroy our communities. Fun for all ages!